Due to computer issues, I wasn’t able to get this up yesterday, but that just allows me to harvest quotes and play off all of the great posts and articles about Walker’s outing, while the off-day means I’m not obligated to bang out a gamethread instead. So hey, instead of talking about the rising frustration about the offense, Felix’s lack of support, the bullpen’s bizarre collapse or in-fighting about Raul Ibanez, let’s focus on the fact that the M’s have one of the best pitching prospects in minor league baseball. I say this as someone who’s been a bit more lukewarm on Danny Hultzen than his numbers might lead you to believe. * Hultzen’s older, has an extremely high floor, and will pitch in Seattle fairly soon, but Walker’s potential and poise make him the superior prospect. Everyone mentions how raw he was coming out of high school as a two-sport star. He had a live arm, not a lot of coaching, and enough question marks that pushed him down to the supplemental round – and enough that many saw the M’s selection as an overdraft. And that’s why it’s so amazing to actually see Walker now. Raw is just not the word that jumps to mind when you see him. His fastball command isn’t perfect, but he’s by no means wild. His new pitch, a cutter that he learned late last year and really showed off in spring training, simply wasn’t working – he didn’t have a feel for it. So he worked around it, and used his big breaking curve ball as a put-away pitch instead. His poise was tested by an umpire who may not have been used to a 70MPH death-dealing curve, and at least one of his two walks absolutely needs an asterisk by it. But he caught himself, refocused, and worked out of trouble. The first thing you notice about Walker is, of course, his size. He’s tall, athletic, and his mechanics make good use of that build. While most athlete height/weight listings are…generous, Walker looked at least his 6’4″ listing. He stood next to Alex Liddi, also listed at 6’4″, for the national anthem and looked a touch bigger. The second thing you notice is that his throwing motion is easy, not violent or complicated. This may help his fastball seem a bit faster than its plenty-fast 94-97mph, and, as Jason Churchill mentioned, helps him maintain his velocity from the stretch. He started his night off with a bang – striking out Giants’ CF prospect Gary Brown out on three pitches. He gave up his first hit to the 2nd batter, however, and didn’t really show pure strikeout stuff with his fastball again. I was curious to see how he handled lefty hitters, but they didn’t present many problems for him. No one’s confusing the Fresno Grizzlies with the 1927 Yankees, but Todd Linden’s a pretty good professional hitter, and Walker absolutely froze him with his curve ball and ended up striking him out twice. Roger Kieschnick isn’t great, but he’s a successful PCL hitter, so it’s not like Walker faced a terrible line-up. He was able to move his fastball around, get some fouls and fly balls off his cutter, and then go to the curve when ahead to righties and lefties alike. 1) His curve ball. Walker changed the grip on it this spring, but this looked more like the curve that first opened eyes in instructs several years ago. This spring, his curve averaged 76-77MPH, but on Tuesday, it was in the low 70s, and the absolute pitch of the night came in at 69. That one elicited a spontaneous giggle from me. It had clear two-plane break, and looked like it was going into the earhole of the righty batter before dropping into the strike zone. It was just one night, but the curve was an easy plus pitch. I’m just sort of surprised, given the struggles he had with it last year, and with so much talk about how his cutter was becoming his go-to breaking ball. 2) Poise. I talked about it above, but this looked like a veteran. Walker pitched around a subpar cutter and subpar umpiring without getting flustered (and he had opportunities) and without resorting to centering fastballs. He started using more fastballs and pitching up, and got some quick fly-outs in the middle innings. It didn’t help his FIP numbers, but it looked deliberate – and smart. 3) Control. He began the year walking a ton of Southern League hitters, but something clicked for him in late May, and whatever change he made continues to work. This is not a guy who throws 98 and hopes for the best. 1) His control of the fastball was great, but the Grizzlies put some good swings on it. His motion is clean and efficient, but perhaps not the most deceptive. His height may give him a deeper release point, but he didn’t have too many whiffs. 2) His cutter was just off. He mentioned this in a post-game interview with Ryan Divish, but batters clearly ID’d the pitch and he wasn’t spotting it where he wanted to. It wasn’t bad – no one really pulled a ball all night, but this pitch got rave reviews in the spring and through the AA season, and at least on Tuesday, it was something of a letdown. 3) As awesome as the big, slow curve is, I wonder if MLB hitters will be able to react when the velocity differential is so huge. Again, Walker touched the high 90s, and then dropped in a curve that occasionally hit the high *60s*. It was a very good pitch, and no one in Fresno’s line-up looked prepared to punish it. But I wonder if that’ll be true in the big leagues. Stephen Pryor worked on a slow curve this spring too, and he’d have a Walker-esque velocity difference if only he was healthy and felt like throwing the pitch in game situations. Something to watch, but it feels like a nitpick given how effective the pitch was. * I’m happy to report that Hultzen rejoined the Rainiers tonight and tossed 6 scoreless innings against Las Vegas with 6 Ks. Still, I’m a bit concerned that he may run larger platoon splits than his MiLB numbers would suggest (ala Carter Capps/Brandon Maurer), and he simply hasn’t shown the Maddux-like command that some attributed to him out of UVA. Now, a lot of this isn’t Hultzen’s fault – he’d be a great pitching prospect for anyone, but he’s held to an extremely high standard as a #2 overall pick. But in 2012 he had that bizarre lapse in command in Tacoma and in 2013 he’s been shelved with a sore shoulder. No one’s saying he’s bad, but like pretty much any GM in the game, I’d take Walker. It’s 90 degrees in Seattle today, a second straight perfect day. I’ve got a beer, my kids are playing on a slip and slide, and for whatever reason, I just can’t summon the will to write about Jeremy Bonderman vs. Edwin Jackson. Interesting that Wedge has bumped Seager down from his customary 3rd spot to….I’m sorry…I’ve got an emergency gin and tonic to prepare. Go M’s! Odd start time, and odd uniforms today. The M’s and Cubs are wearing uniforms from 1909 – the Cubs sporting the, er, Cubs uniforms of that year and the M’s donning Seattle Turks jerseys. The Turks were in the old Northwest league, then categorized as class B. With the Pacific Coast League pulling back from the northwest, the B-division NWL was pretty advanced, and it wasn’t too rare for players to jump from the NWL to the majors. There were plenty of local teams in the league – Tacoma’s original Tigers played in the league from 1906-1917, Seattle joined in 1907, and over the 12 or so years the league operated, there were teams in Bellingham, Spokane, Victoria, Vancouver, Grays Harbor, Aberdeen, Everett, Butte and Great Falls. Seattle’s club was known as the Siwashes for its first two years, but they changed it, perhaps realizing that “Siwash” was a racist, derogatory term for Native Americans. * So, in 1909, they became the Turks** (sensitivity isn’t a light switch you just flick on, apparently) and the club won an astounding 109 games to win the league title. Maybe because they wanted to go out on top, and maybe because the Ottoman Empire was both far away and fading, they changed their name again the following year – this time to the Giants. The Northwest League had some pretty good names, if you look past things like ‘Siwashes’ (they probably went with that since Spokane was already in the league as the Indians). The Vancouver club’s name in the inaugural season was the “Horse Doctors.” “Veterinarians” was apparently too hifalutin. Victoria was the “Legislators” which is the sort of name that probably wouldn’t make anyone’s short list these days (though Sacramento had a similar name, the Solons, around this time). Minor League baseball was in flux around the turn of the century, trying to stay profitable in the sparsely populated far west. There’d been a Pacific Northwest League years before, which then merged with a California league to form the Pacific Coast League. The Seattle Indians were a part of that first season in 1903, but the league contracted in 1906, and Seattle merged with the four-year old Northwest League. Tacoma migrated to the PCL for just one season before essentially re-joining the Northwest League. Portland also moved from the PCL (where they were the Beavers) to the NWL (where they became the Pippins). OK, enough history. The M’s face the Cubs’ immensely talented right-hander Jeff Samardzija today. The Cubs famously bought Samardzija away from the NFL (he was a great wide receiver at Notre Dame) and then watched in horror as he moved through the minor leagues with Blake Beavan-ish strikeout numbers. He threw a darting 95-98 sinker, a slider and a splitter, but these generated contact, not whiffs. Something clicked for him in 2008, and he started getting K’s – he struck out over a batter an inning in is initial cup of coffee that year. In 2009, his K rate fell again, and paired with his poor control and home run problem, he regressed to a sub-replacement-level pitcher. In 2010, he was actually even worse, with fewer K’s, more BBs and HRs. He’d dumped his sinker, become an extreme fly ball pitcher, and changed his delivery from a whippy three-quarters to more of an over-the-top release. He looked like he was well on his way to becoming a very expensive bust. In 2011, everything changed. He moved his delivery back closer to where it was when he came up, ditched his sub-par curve that he threw in 2009-10, and his velo played up as a reliever. He had a very good year, so it surprised me when the Cubs moved him back to the rotation in 2012. His fastball is still oddly hittable for a 96mph pitch with plenty of movement, but his splitter is a real wipeout pitch, especially to lefties, and his slider’s very good against righties. But one of the biggest things that helped Samardzija take his big step forward was refinement in his location. Both lefties and righties have punished Samardzija on middle-in pitches, and they still do. Early in his career, his command was terrible, so he mixed a ton of walks with centered pitches (and, I’m guessing, some ill-advised advice to “control the inside corner” and push people off the plate). As his command improved, he was able to pitch to the outside edge much more effectively, and that’s helped him get to his breaking balls – his first strike percentage moved from about 56% from 2008-2011 to 62% these days. The M’s send Aaron Harang to the hill, with Nick Franklin getting an off-day. You’re looking outside and really considering blowing this one off, aren’t you? Franklin’s off-day isn’t just to give him a rest – he’s got a stiff neck, but is still available to pinch hit. Michael Saunders hurt his finger, so he’ll be out for a few days. * – It’s amazing to look back at something like ‘Siwashes.’ I mean, it’d be inconceivable that you could get away with naming a sports team something like “Redskins” today, right? Wait, what? Yesterday was probably not an important day to many of you unless it’s your birthday in which case, oh gosh, I’m sorry. Or it may be if you’re a history buff, considering we have the assassination of Franz Ferdinand, the Treaty of Versailles, and the beginning of the Irish Civil War all happening on the same day in various years. Man, that is some history. But for me, today marks the four-year anniversary of one of the most bizarre minor league box scores I’ve ever had to talk about, which was the defeat of the High Desert Mavericks at home against the Lake Elsinore Storm by a final score of 33-18 in a game that lasted four hours and ten minutes. Every few months, I go back and look this one up and each time I seem to uncover something new. Its depths likely aren’t endless, but that such a box score would have certain eccentricities goes without saying. This time around, I’ve decided to report on my findings on this particular trip down the rabbit hole. What follows is going to be a lot of fragments pertaining to what happened and, to a lesser extent, how it came about and what happened next for the players involved. I’m not going to try to re-construct a narrative from it because, for one thing, you can just follow the game log, and for another I would imagine that to be even more tedious. I’m also not trying to write “well” about this box score so much as relish in its oddities. June 28th 2009 was a Sunday. A crowd of 1,054 was enduring a gametime temperature of one hundred degrees and the wind was blowing out to left at seven miles an hour. We certainly never expected what happened next. I looked at the pitching probables and saw “Chi: Wood” and instantly thought of Kerry Wood. He hasn’t pitched for the Cubs in years, and retired and all of that, but still…if you weren’t watching baseball in the late 90s, you missed one of the most incredible debuts in baseball history. Wood’s 20 strikeout game came in his 5th big league start, and it is by some measures the best pitched 9-inning game ever. So, uh, yeah, good thing the M’s are facing Travis Wood. Wood’s had something of an odd career path so far. He came up with Cincinnati and was an above-average starter for half a year in 2010. That faded to something more like average for another half year in 2011, and then deteriorated to “bad” last year with Chicago. He’s a lefty with a straight, rising 90mph fastball who is about as grounder-averse as they come. Predictably, his results tend to be more volatile – if a bunch of fly balls go over the fence, his ERA and, especially, his FIP suffer. If they stay in the yard, he looks decent (think of Blake Beavan’s quality-start streak in his first half-season). This year, they’ve stayed in the yard, and Wood comes into the game with an ERA under 3 and a solidly above-average FIP. He throws a very straight 90mph four-seam fastball, a straight, almost rising sinker with enough vertical movement that you figure Wood doesn’t quite get either the concept or the execution of a sinker, a slider, and a flurry of cutters. He throws the occasional change as well, but he throws about 30% cutters to both righties and lefties, along with 50-60% fastballs. So far this year, he’s benefited from a ludicrously low BABIP, but he’s helped himself by cutting back on free passes as well. Unlike with the Pirates hurlers in the last season, there’s really not much of a mechanical or strategic cause to point to for the changes in his results. His pitch mix hasn’t really changed. His delivery’s become more over-the-top, less 3/4, but that’s been a gradual shift since he came up, not a big move in 2013. Thus, the BABIP and HR/FB (both numbers are career bests for Wood) look a lot better as suspects. Enough about Wood. Today’s going to be remembered by M’s fans for the line-up – both who’s in it and where they’re playing. Brad Miller makes his debut for the M’s in the starting line-up, batting 9th. Dustin Ackley gets his first start since his return from Tacoma too, and he’ll play center-field. I’m not clear on what Ackley’s done in the past day – he may have needed to prove to Wedge that he could handle playing CF in a spacious park, but I thought it was notable that he’ll debut against a lefty, and not the righty Jeanmar Gomez. Oh well. This may be the first start of a long-term double-play combo for the M’s, and hopefully this could be the first game of many for Ackley in the OF. That’s actually one of the most watchable line-ups the M’s have trotted out in quite a while. Ibanez DH’ing, Franklin, Zunino, Miller all in the line-up, Ackley in CF…this game’s not short on storylines. The 40-man move to get Miller was announced – Josh Kinney’s been outrighted to Tacoma. As a guy still rehabbing his way back, that’s probably smart; if they’re able to slip someone through waivers, he’d be the one to slip. James Paxton starts tonight in Tacoma. 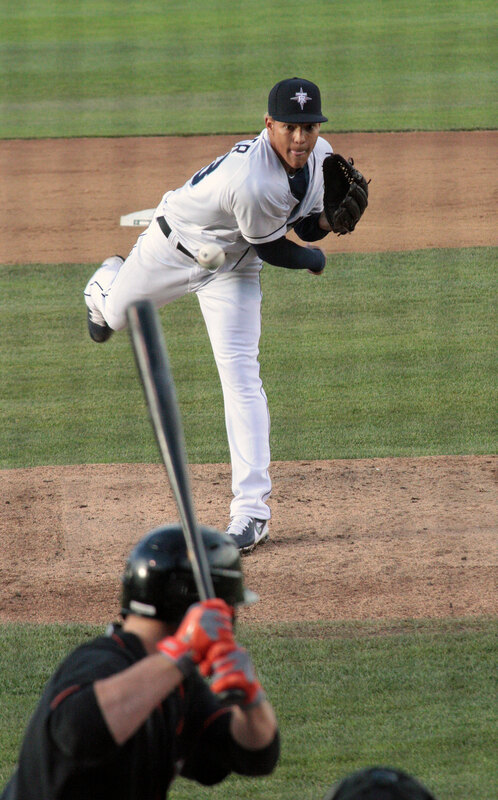 Hultzen started last night, Tai Walker a few days before that (yes, I’ll have a recap of that – just have to wait until MillerMania dies down a bit) and Paxton winning the PCL pitcher of the week recently, the M’s pitching depth is finally rounding into form. Chance Ruffin and Anthony Fernandez start for Jackson in a double-header, while Thyago Vieira and Tyler Pike start for Everett and Clinton, respectively. Good day in the organization. Brad Miller – Why Now? Ever since Dave’s post a few days ago urging the M’s to call up Brad Miller, it’s been discussed throughout the M’s blogosphere. Alex Carson of Prospect Insider/Lookout Landing and I talked briefly about it on Tuesday. I’ve seen quite a few fans question the move, given the question marks surrounding his defense. But ultimately, this is the right move. Why? * Miller’s made a number of errors, generally on routine plays. OK, you know who else used to do that? Nick Franklin. I haven’t seen Miller play as much as I saw Franklin, but I saw several more mental lapses from Franklin than I have from Miller. This isn’t about picking on Franklin as it is pointing out that mental lapses *can* be minimized in MLB. The stakes are higher, the fields are better, and there’s more time to prepare and less time spent waiting for connecting flights and bus trips. This isn’t handwaving; Miller needs to work at this, but this a fundamentally different situation from a hitter who has trouble with breaking balls or good velo. This isn’t a skills issue. MLB is *brutal* on kids with deficient skills, and it *can* be brutal on those who aren’t able to focus 100% of the time. But it’s often a good environment to improve focus as well. From what I’ve seen, he’s got plenty of skill to play SS at the big league level, and I never would’ve said that about Nick Franklin. * Why? Because Miller now gets to learn from Nick Franklin, a guy who’s become a *better* fielder since his call-up, and he gets to work with one of the best defensive shortstops in the game in Brendan Ryan. I think we all have this image of Ryan as a joker, as a free spirit who wants to do imitations instead of work on his craft, but that’s not entirely accurate. There’s a reason the M’s kept Brad Miller with the big league club so long this March, and there’s probably a reason they wanted Miller to play 2B alongside Ryan. Ryan has a lot to pass on in terms of preparation and learning hitter and pitcher tendencies, and Miller will benefit from that a heck of a lot more than he will from fielding a few more grounders in Albuquerque or Salt Lake. * Ultimately, because the M’s need to see if he can hit. Miller reached base in every game he played for Tacoma, so I’m going to assume a batting line better than Ryan’s is a given. But if he’s able to approach what Franklin’s done, then that really changes how the M’s approach the offseason. The M’s haven’t had offense from the position in a loooong time, and what better time to get a sense of their 2014 starting line-up than now? The season’s over from a contention point of view. Welcome to the show, Brad. P.P.S – Dave’s post on Miller’s call-up is here. Ryan Divish has the news from Tacoma. In Miller’s final game for the Rainiers, he hit a home run to extend his hitting streak to 22 games. Not bad. I won’t spend too much time talking about Miller, since I just wrote that the Mariners should make this move a few days ago. All the reasons why I think it’s time for Miller to join the Mariners now are in that post. I’m glad they agreed. Divish noted in a subsequent tweet that Brendan Ryan will move into a backup role (for real this time), with Carlos Triunfel heading back to Tacoma to open up a spot on the 25-man roster. Miller will take over as the starting shortstop, Ryan will serve as the backup, and Triunfel will play regularly at Triple-A. This is the best alignment of talent the Mariners have right now. Expect Triunfel to return whenever Ryan gets traded to a contender, which will probably happen closer to July 31st. The Mariners will also have to add Miller to the 40 man roster. If they want to keep everyone in the organization, they could put Jesus Sucre on the 60 day DL, since he’s already 20 days into his DL stint and it doesn’t sound like he’s anywhere close to returning. If they go with the DFA option, I’d guess that Lucas Luetge would be the most vulnerable, though the Mariners could also potentially DFA Aaron Harang and replace him with Erasmo Ramirez. My guess is that that’s the move that’s going to happen sooner or later, so since they’ll need a 40 man spot tomorrow, Harang is scheduled to go Saturday, and Erasmo could take that spot on regular rest, they might just make that move now in order to not have to DFA anyone else. We’ll find out tomorrow who is leaving the 40 man to make room for Miller, but the main point is that he’s now the Mariners starting shortstop. He might not have the defensive chops to stay there long term, but the best way to find out is to see how he handles the position for the rest of the year. His bat is going to be a legitimate upgrade, and if he can cut down on the errors, the Mariners long running search for a shortstop of the future may be over. Dustin Ackley is back, in one sense. Not in the sense that “Dustin Ackley is back!” like we all hope we’re shouting a week from now. But Dustin Ackley is back on the Mariners, probably for good, and after sitting out a couple games it seems like he’s going to get started in actual action on Friday. He’s going to be an outfielder most of the time, and that matters, but what we care about most is the bat, since it’s the bat that’ll determine whether or not he’s a keeper. For Ackley and for the rest of Ackley’s career, this is going to be an important three months, as he simply has to show more than he showed before getting sent to Tacoma. Now, some quick background. As a rookie, Ackley posted a .766 OPS. He went into that offseason feeling pretty good about himself, and in 2012, he posted a .622 OPS. That was a letdown. Remember that letdown? Remember when it was a surprise that Ackley was bad? 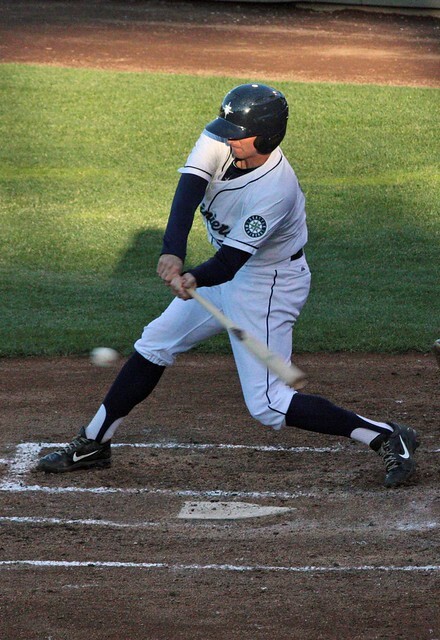 Coming into 2013, Ackley made some changes to his swing and his stance. They were revealed in spring training, and Ackley felt encouraged, as anyone does after making deliberate adjustments. He felt like something had to be worked on. Ackley’s spring was underwhelming, and he started the year 3-for-30 with three singles. Then Ackley changed the changes to his swing and his stance. That decision was made during a day off, and Ackley felt encouraged, as anyone does after making deliberate adjustments. He suggested he felt the best he’d felt in a couple years. Between then and getting demoted, Ackley posted a .572 OPS. The second half of April was pretty solid; the month of May was a disaster from start to finish. It finished in the Pacific Coast League. Now Ackley’s back again. This time, it wasn’t about mechanical changes — it was about mental changes, changes in approach. Eric Wedge wanted to see Ackley more ready to hit, and while Triple-A pitching isn’t major-league pitching, Triple-A pitching got abused much of the time Ackley stood in. Ackley claims he has his confidence back, and he just hit .365 at a high level with 19 walks and 14 strikeouts. Ackley didn’t chase in Tacoma. He wasn’t over-aggressive, he wasn’t too passive, and he made a lot of contact. He flashed some line drives to left and left-center. There are reasons to be encouraged, because Ackley is encouraged and the stats back it up. So, a poll. I think I know how this is going to go, but I’d like to make sure. Maybe you guys will surprise me. Usually, you guys don’t surprise me, but I am very smart about not being surprised. This is a lie. I am shockingly easily startled, even by things I know are there. If anything it’s only getting worse. Felix was brilliant against Pittsburgh a few months ago, and now he has the added motivation of trying to atone for his 5 IP 7 R meltdown against the Angels on the 20th. The M’s could use a good outing, as their bullpen’s still in some disarray after Carter Capps struggles, Tom Wilhelmsen’s fall from grace and the fact that the team now relies fairly heavily on Yoervis Medina in high-leverage situations. Jeanmar Gomez, by fWAR, has been a below-replacement-level pitcher in 2013, with a FIP pushing 5, a lack of strikeouts and a few too many walks. By fielding-dependent measures, however, he’s been a great find – someone who’s solidified the back of the rotation and kept the Pirates in nearly every game he’s started. Like Jeff Locke, he’s throwing a few more balls than he has in previous seasons (when he toiled for Cleveland), and he’s also benefiting from tremendous defense behind him. The question is how these two things work together. As I mentioned yesterday, the Pirates throw the fewest strikes of any team in baseball. You know what else the Pirates do? They allow – by far – the fewest hits on balls in play. The Pirates defense has been a huge asset to their pitching staff. Starling Marte and Andrew McCutchen are outstanding in the OF, but with so many ground-ballers (the Pirates *also* lead the league in GB%), they’ve relied heavily on Clint Barmes and Jordy Mercer at SS/2B, respectively, while Pedro Alvarez has been above average at 3rd. They’ve got solid defenders at key positions, so it’s not like this is ‘lucky’ per se, but their DER and park-adjusted defense numbers are off the charts. Tampa’s 2011 team is the best recent comp for what the Pirates are doing in 2013, but to find a team that was clearly, unambiguously better, you’ve got to go all the way back to the 2001 Mariners. Clint Barmes and Andrew McCutchen can pick it, but to get to this level of DER while also employing Garret Jones, I wonder if something else is at work. Here’s a plot of where Gomez threw his pitches in 2012. Here’s the same graphic for 2013. Again, the shift is subtle, and the magnitude’s much lower than we saw with Locke, but quite a few pitches in the zone, particularly in the center of the zone, have been shifted to the edges – and actually off the outside edges of the plate. It’s not clear to me if the Pirates are getting more balls in play on out-of-zone pitches, but that would certainly account for a lower BABIP. Beyond that rather speculative theory, this is another indication that there are many ways to succeed in MLB. The Pirates line-up, even with McCutchen and Marte, own a 95wRC+, pretty close to the M’s 93. The M’s came into the year determined to make a break with their approach of 2009-10, when they had defenders at SS/CF, and occasionally in the corner spots as well. Whatever you think of how those (crappy) M’s teams were put together, the Pirates are another example of a team actually succeeding with a blueprint the M’s helped to popularize and now disown: that assembling a team of great defenders can help your pitching staff outpitch their “true talent” and drive runs allowed way down. Obviously, that’s not the entire story. They’ve outplayed their pythagorean and 3rd order winning percentages thanks to timely hitting and a lock-down bullpen (Jason Grilli is putting together a historical, all-time great sort of season). They’ve got uber-talented, franchise-core types in McCutchen and Marte – two guys who would be the best position players on the M’s if they played for Seattle. But fundamentally, this club is the anti-Mariners – they field the ball, keep it close, and their bullpen’s amazing. They’re getting anti-Mariner results on the scoreboard, too. People have written a lot about Felix’s diminishing fastball. People have tried to make comparisons to Tim Lincecum, and Felix sure as shoot doesn’t touch 100 anymore. But he can touch 94 and 95, and right now he’s gaining strength. It’s looking like he hasn’t slipped from last year. He might even end up gaining a little bit, overall. Talk about the days when Felix might become a finesse pitcher appear premature. He’s got as hard a fastball right now as Clayton Kershaw, if not a little harder, since separating the heat and the changeup is tricky. And can we take a moment to pause and acknowledge how bizarre it is that separating the heat and the changeup is tricky? Is Felix’s changeup someday going to lap his sinker? Is it going to be like when a baserunner accidentally passes the guy who’s supposed to be in front of him? That seems like the logical conclusion to this ongoing absurdity. So what about Felix’s velocity? He threw his hardest in his early years, and in his early years, he was undeveloped. At one point Felix made the leap, and from then the fastball has been slipping while the results haven’t been. You’re taking velocity to be a meaningful indicator. What’s a more meaningful indicator than how batters do against the pitchers, no matter how hard they’re thrown? As a rookie in 2005, Felix allowed about 76% contact. So far this year, he’s allowed about 76% contact. There’s not really any proven link between Felix’s heat and Felix’s results, and it’s the results we ultimately want. Pitchers are fragile. So tragically fragile. (Tragile?) Felix is one of the best pitchers, and he’s the best pitcher on this team, and he’s the face of this franchise. He’s the superstar, and he’s under contract for a long time, and he’s the guy you’d pay to watch. He has his own special cheering section, which used to be more rare than it is now, in part because of Felix’s cheering section. If Felix’s velocity were slipping, we might be concerned that the structural integrity of his joints is also slipping. We’re always worried about the possibility that Felix will get hurt, and the team will be devastated. The evidence suggests that Felix is getting stronger. There’s no sign of injury, and there’s no sign of fatigue which could lead to injury. Didn’t the team just put Felix through a rigorous physical exam over the offseason, prior to his contract extension being finalized? Didn’t we already know he wasn’t hurt? The Mariners put cameras in every single pore and every single organ. There was nothing wrong at all, except for some fraying in the elbow, leading to the contract’s containing protective language. The shoulder? Nothing up with the shoulder. And the shoulder’s the biggie. We already had peace of mind, before this peace of mind. It’s been a long time and a lot of pitches, though, since that exam. It’s good that nothing’s started to go wrong. But like you said, pitchers can break at the drop of a hat. Maybe the next pitch is the bad one. There’s no way to know. Pitchers are only durable until they’re not, and that can happen suddenly. If you’re looking to live in fear, you can live in fear all the time, if you like. There’s always something to worry about, because there’s always the unknowable future. I’m just trying to say something positive about Felix Hernandez. Have you seen this team? What is there to say? Okay, great, Nick Franklin is succeeding and maybe now Dustin Ackley is fixed, and Taijuan Walker just pitched well in his Triple-A debut so he might not be all that far off. But the Mariners aren’t good and they’re not in the race and the season’s not half-over. The season’s not half-over. Jesus! There’s nothing wrong with being positive about Felix Hernandez. It’s lighting a candle in a dark auditorium. Present the facts, but don’t over-interpret them. Lay them out and say what you can say without stretching. Facts can be interesting on their own, and if a fact doesn’t seem interesting, but you think it is interesting, you should only explain why it’s interesting using other, related facts. Fact: Felix’s velocity is up. That’s about it. What does it mean? Can’t really say. It’s not science to begin with a fact and then try to figure out what it means in the bigger picture using just your biased imagination. Well, it’s not good science. Facts are firm soil. Interpretations can be quicksand. I don’t think I did over-interpret. Are you sure you weren’t just assuming my motives? Are you the one over-interpreting? Does objectivity even exist? In isolation, sure, but when humans become involved, is there such thing as perfect objectivity in the eyes of the beholder? We’re not computers. We’re mostly computers, but we’re computers with agendas, like future evolved terror computers. We might be over-thinking the Mariners. Doesn’t seem like we’re talking about the Mariners. In a way, we’re never talking just about the Mariners.